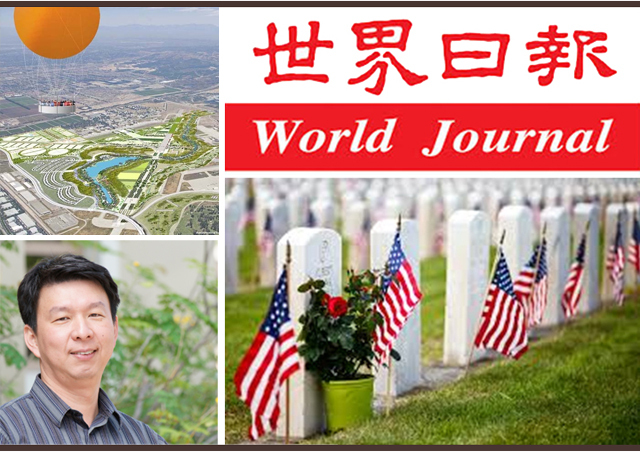 ON NOVEMBER 23, 2014, AN ARTICLE ON THE PROPOSED ORANGE COUNTY GREAT PARK VETERANS’ CEMETERY RAN IN THE WORLD JOURNAL, THE LEADING CHINESE NEWSPAPER PUBLISHED IN THE U.S. The approval to build a cemetery for OC veterans as part of the Orange County Great Park in Irvine, CA, has caused strong objections from residents in adjacent neighborhoods. However, according to award winning landscape architect, Mr. Li Wang, there are many design elements which could be utilized to integrate the veterans’ cemetery into the park without intruding on residential areas. He said by applying a garden themed landscape design approach, it will minimize the negative impression of a cemetery, and furthermore transform the project into an iconic park space and a possible tourist attraction. 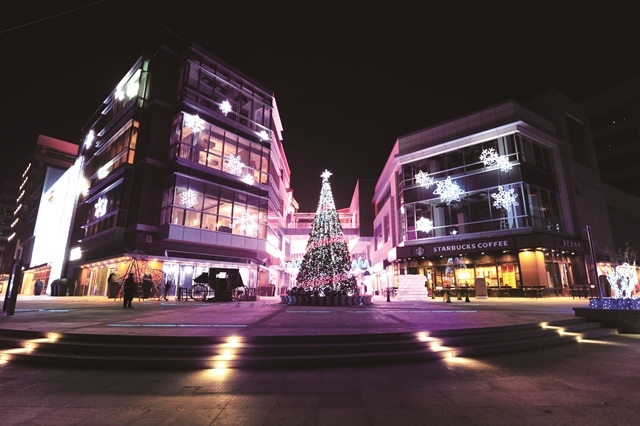 Mr. Wang, who has offices in Orange County and China, also added that it would take this project 3-5 years to seek funding, layout design, conduct feasible studies, and complete construction. He encourages concerned Chinese-Americans to be part of the development process, voicing their opinions to protect their rights and interests. Chinese- Americans are often less interested in community development matters. However, this OC veterans’ cemetery project has awakened the community sense of many Chinese-American residents and their awareness of the importance of community development participation, Mr. Wang said. They are now much more aware of the importance of voicing their concerns via proper channel and at the right time. He sees this as a good starting point for Chinese-Americans to finally know how to live an American life. Mr. Wang is the founder and president of The LCW Group, a San Juan Capistrano based, award winning landscape architecture firm. Mr. Wang led the design team on the Civic Center plaza design project for City of Tracy, CA. He also serves as a member of the USC architectural school mentor program which provides portfolio review and career guidance for both undergraduate and graduate students. Mr. Wang’s other recent projects include many major and large-scale landscape developments throughout China, such as 350 acres of Moushiu River Open Space and Downtown Redevelopment Masterplan in City of Jimo, Shandong Province; 415 acres of Erlang Township Tourism and Master Landscape Plan in Erlang Township, Sichuan Province; and 300 acres of Beiren Wetland and Sports Park Master Plan in City of Chengdu, Sichuan Province. As a long-time resident in south Orange County, Mr. Wang cares about the development of the 1,300-acre Great Park. He suggests that since the 125-acre designated veterans’ cemetery site is right next to a future residential neighborhood as well as a high school, it will bring certain impacts to nearby residents as well as the developer. 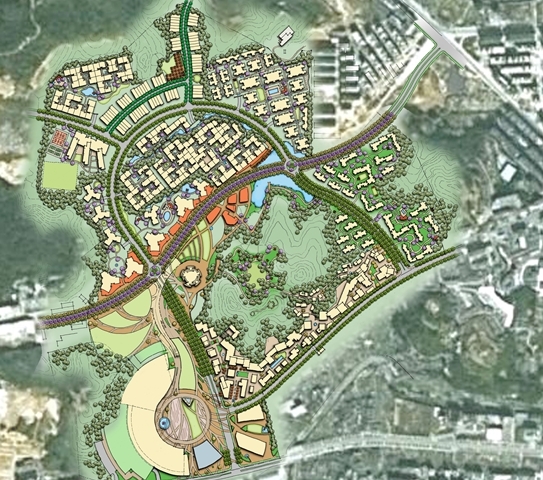 However, from a landscape architect’s point of view, Mr. Wang pointed out that by merging the park and cemetery elements, and with well laid out site planning, the veterans’ cemetery site can have a peaceful feel and be well integrated into the Great Park as well as be compatible with the surrounding residential uses. One of the many successful examples is Hollywood Forever, which has become a tourists’ must-see travel stop with its open, healthy, and park oriented design principles as well as hosting of many festival events such as concerts or movie appreciation nights. On the design of this veterans’ cemetery, Mr. Wang continued, if there is any flexibility in the layout standards, there are many design strategies that can be implemented to mitigate negative impacts, if any, to the nearby residents. One consideration would be to avoid the traditional checker-block type tombstone layout, and instead introduce a curvilinear design layout. Also, a green-belt buffer zone between the site and the residential area can eliminate the direct sights from residential areas and also soften the image of the cemetery scene. Landscape architecture and culture shares a tight connection, Mr. Wang shared. Many large and small landscape architecture firms from U.S. and other Western countries entered China market in recent years. 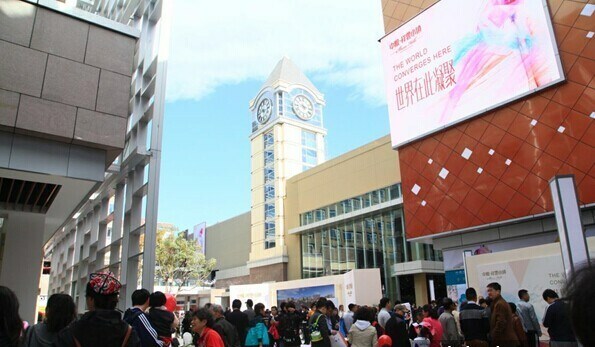 Most firms brought western design “expertise” into China market without any basic understanding of China local culture. This often led to conflicts and created “culture shock” cases and furthermore caused project contracts to be terminated by China clients. Examples included designers who brought the concept of outdoor tanning area as well as its associated outdoor furniture designs to China, not knowing sun-bathing is something that most Asian would avoid all year long if possible. Another example is the California / Mediterranean style architecture design that can include a “Casita,” which is often prepared for in-laws or visitors. While this may be a favorite element in more upscale residential development in western cultures, in Chinese culture the “Casita” type of house is commonly found in lower class society and therefore will only be used for maids or servants. In Chinese culture, special guests and elders are always housed inside the main building to show respect. Because of these lifestyle differences, Mr. Wang points out that the cultural background and acceptance of nearby Chinese-Americans and other residents should be considered and taken into account as part of the OC veterans’ cemetery design process.